Real-time strategy (RTS) is a sub-genre of strategy video games in which the game does not progress incrementally in turns. This is distinguished from turn-based strategy (TBS), in which all players take turns when playing. In an RTS, the participants position and maneuver units and structures under their control to secure areas of the map and/or destroy their opponents' assets. In a typical RTS, it is possible to create additional units and structures during the course of a game. This is generally limited by a requirement to expend accumulated resources. These resources are in turn garnered by controlling special points on the map and/or possessing certain types of units and structures devoted to this purpose. More specifically, the typical game of the RTS genre features resource gathering, base building, in-game technological development and indirect control of units. The term "real-time strategy" was coined by Brett Sperry to market Dune II in the early 1990s. The tasks a player must perform to succeed at an RTS can be very demanding, and complex user interfaces have evolved to cope with the challenge. Some features have been borrowed from desktop environments; for example, the technique of "clicking and dragging" to select all units under a given area. Though some game genres share conceptual and gameplay similarities with the RTS template, recognized genres are generally not subsumed as RTS games. For instance, city-building games, construction and management simulations, and games of the real-time tactics variety are generally not considered to be "real-time strategy". The genre that is recognized today as "real-time strategy" emerged as a result of an extended period of evolution and refinement. Games that are today sometimes perceived as ancestors of the real-time strategy genre were never marketed or designed as such at the original date of publication. As a result, designating "early real-time strategy" titles is problematic because such games are being held up to modern standards. The genre initially evolved separately in the United Kingdom, Japan, and North America, afterward gradually merging into a unified worldwide tradition. Tim Barry in May 1981 described in InfoWorld a multiplayer, real-time strategy space game that ran ("and probably still is") on an IBM System/370 Model 168 at a large San Francisco Bay area company. He stated that it had "far better support than many of the application programs used in the business", with a published manual and regular schedule. Comparing its complexity to Dallas, Barry recalled that "when the game was restored at 5 P.M., a lot of regular work stopped". Ars Technica traces the genre's roots back to Utopia (1981), citing it as the "birth of a genre", with a "real-time element" that was "virtually unheard of", thus making it "arguably the earliest ancestor of the real-time strategy genre". According to Ars Technica, Utopia was a turn-based strategy game with hybrid elements that ran "in real-time but events happened on a regular turn-based cycle." According to Brett Weiss, Utopia is often cited as "the first real-time strategy game." According to Matt Barton and Bill Loguidice, Utopia "helped set the template" for the genre, but has "more in common with SimCity than it does with Dune II and later RTS games." Allgame listed War of Nerves as the oldest "2D Real-Time Strategy". Barton also cites Cytron Masters (1982), saying it was "one of the first (if not the first) real-time strategy games." On the other hand, Scott Sharkey of 1UP argues that, while Cytron Masters "attempted real time strategy", it was "much more tactical than strategic" due to "the inability to construct units or manage resources". BYTE in December 1982 published as an Apple II type-in program Cosmic Conquest. The winner of the magazine's annual Game Contest, the author described it as a "single-player game of real-time action and strategic decision making". The magazine described it as "a real-time space strategy game". The game has elements of resource management and wargaming. In the United Kingdom, the earliest real-time strategy games are Stonkers by John Gibson, published in 1983 by Imagine Software for the ZX Spectrum, and Nether Earth for ZX Spectrum in 1987. In North America, the oldest game retrospectively classified as real-time strategy by several sources is The Ancient Art of War (1984), designed by Evryware's Dave and Barry Murry, followed by The Ancient Art of War at Sea in 1987. In Japan, the earliest is Bokosuka Wars (1983), an early strategy RPG (or "simulation RPG"); the game revolves around the player leading an army across a battlefield against enemy forces in real-time while recruiting/spawning soldiers along the way, for which it is considered by Ray Barnholt of 1UP.com to be an early prototype real-time strategy game. Another early title with real-time strategy elements is Sega's Gain Ground (1988), a strategy-action game that involved directing a set of troops across various enemy-filled levels. TechnoSoft's Herzog (1988) is regarded as a precursor to the real-time strategy genre, being the predecessor to Herzog Zwei and somewhat similar in nature, though primitive in comparison. IGN cites Herzog Zwei, released for the Sega Mega Drive/Genesis home console in 1989 as "arguably the first RTS game ever", and it is often cited as "the first real-time strategy game" according to Ars Technica. It combines traditional strategy gameplay with fully real-time, fast-paced, arcade-style action gameplay, featuring a split-screen two-player mode where both players are in action simultaneously and there are no pauses while decisions are taken, forcing players to think quickly while on the move. In Herzog Zwei, though the player only controls one unit, the manner of control foreshadowed the point-and-click mechanic of later games. Scott Sharkey of 1UP argues that it introduced much of the genre conventions, including unit construction and resource management, with the control and destruction of bases being an important aspect of the game, as were the economic/production aspects of those bases. Herzog Zwei is credited by 1UP as a landmark that defined the genre and as "the progenitor of all modern real-time strategy games." Chuck Sperry cited Herzog Zwei as an influence on Dune II. Notable as well are early games like Mega Lo Mania by Sensible Software (1991) and Supremacy (also called Overlord – 1990). Although these two lacked direct control of military units, they both offered considerable control of resource management and economic systems. In addition, Mega Lo Mania has advanced technology trees that determine offensive and defensive prowess. Another early (1988) game, Carrier Command by Realtime Games, involved real-time responses to events in the game, requiring management of resources and control of vehicles. The early game Sim Ant by Maxis (1991) had resource gathering, and controlling an attacking army by having them follow a lead unit. However, it was with the release of Dune II from Westwood Studios (1992) that real-time strategy became recognized as a distinct genre of video games. Although real-time strategy games have an extensive history, some titles have served to define the popular perception of the genre and expectations of real-time strategy titles more than others, in particular the games released between 1992 and 1998 by Westwood Studios and Blizzard Entertainment. The success of Dune II encouraged several games which became influential in their own right. Warcraft: Orcs & Humans (1994) achieved great prominence upon its release, owing in part to its use of a fantasy setting and also to its depiction of a wide variety of buildings (such as farms) which approximated a full fictitious society, not just a military force. Command & Conquer, as well as Command and Conquer: Red Alert, became the most popular early RTS games. These two games contended with Warcraft II: Tides of Darkness after its release in late 1995. Total Annihilation, released by Cavedog Entertainment in 1997, introduced 3D units and terrain and focused on huge battles that emphasized macromanagement over micromanagement. It featured a streamlined interface that would influence many RTS games in later years. Age of Empires, released by Ensemble Studios in 1997 tried to put a game in a slower pace, combining elements of Civilization with the real-time strategy concept by introducing ages of technologies. In 1998, Blizzard released the game StarCraft, which became an international phenomenon and is still played in large professional leagues to this day. Collectively, all of these games defined the genre, providing the de facto benchmark against which new real-time strategy games are measured. The real-time strategy genre has been relatively stable since 1995. Additions to the genre's concept in newer games tend to emphasize more of the basic RTS elements (higher unit caps, more unit types, larger maps, etc.). Rather than innovations to the game concept, new games generally focus on refining aspects of successful predecessors. As the paragon example of gameplay refinement, Cavedog's acclaimed Total Annihilation from 1997 distilled the core mechanics of Command & Conquer, and introduced the first 3D units and terrain in real-time strategy games. The Age of Empires idea was refined further by Stainless Steel Studios' Empire Earth in 2001. GSC Game World's Cossacks: European Wars series took the genre in a different direction, bringing population caps into the tens of thousands. Dungeon Keeper (1997), Populous: The Beginning (1998), Jeff Wayne's The War of the Worlds (1998), Warzone 2100 (1999), Machines (1999), Homeworld (1999), Honour & Freedom (1999), and Dark Reign 2 (2000) were among the first completely 3D real-time strategy titles. Homeworld was notable in that it featured a 3D environment in space, therefore allowing movement in every direction, a feature which its semi-sequel, Homeworld Cataclysm (2000) continued to build upon adding features such as waypoints. Homeworld 2, released in 2003, streamlined movement in the 360° 3D environment. Furthermore, Machines, which was also released in 1999 and featured a nearly 100% 3D environment, attempted to combine the RTS genre with a first-person shooter (FPS) genre although it was not a particularly successful title. These games were followed by a short period of interest in experimental strategy games such as Allegiance (2000). Jeff Wayne's The War of the Worlds was notable for being one of the few completely non-linear RTS games ever. It is only in approximately 2002 that 3D real-time strategy became the standard, with both Warcraft III (2002) and Ensemble Studio's Age of Mythology (2002) being built on a full 3D game engine. Kohan: Immortal Sovereigns introduced classic wargame elements, such as supply lines to the genre. Battle Realms (2001) was another full 3D game, but had limited camera views. The move from 2D to 3D has been criticized in some cases. Issues with controlling the camera and placement of objects have been cited as problems. Relatively few genres have emerged from or in competition with real-time strategy games, although real-time tactics, a superficially similar genre, emerged around 1995. In 1998, Activision attempted to combine the real-time strategy and first-person shooter genres in Battlezone, while in 2002 Rage Games Limited attempted this with the Hostile Waters games. Later variants have included Natural Selection, a game modification based on the Half-Life engine, and the free software Tremulous/Unvanquished. Savage: The Battle for Newerth combined the RPG and RTS elements in an online game. A few games have experimented with diversifying map design, which continues to be largely two-dimensional even in 3D engines. Earth 2150 (2000) allowed units to tunnel underground, effectively creating a dual-layer map; three-layer (orbit-surface-underground) maps were introduced in Metal Fatigue. In addition, units could even be transported to entirely separate maps, with each map having its own window in the user interface. Three Kingdoms: Fate of the Dragon (2001) offered a simpler model: the main map contains locations that expand into their own maps. In these examples, however, gameplay was essentially identical regardless of the map layer in question. Dragonshard (2005) emphasized its dual-layer maps by placing one of the game's two main resources in each map, making exploration and control of both maps fundamentally valuable. Some games, borrowing from the real-time tactics (RTT) template, have moved toward an increased focus on tactics while downplaying traditional resource management, in which designated units collect the resources used for producing further units or buildings. Titles like Warhammer 40,000: Dawn of War (2004), Star Wars: Empire at War (2006), and Company of Heroes (2006) replace the traditional resource gathering model with a strategic control-point system, in which control over strategic points yields construction/reinforcement points. Ground Control (2000) was the first such game to replace individual units with "squads". Others are moving away from the traditional real-time strategy game model with the addition of other genre elements. One example is Sins of a Solar Empire (2008), released by Ironclad Games, which mixes elements of grand-scale stellar empire building games like Master of Orion with real-time strategy elements. Another example is indie game Achron (2011), which incorporates time travel as a game mechanic, allowing a player to send units forward or backward in time. A specific genre of strategy video games referred to as multiplayer online battle arena (MOBA), that originated as a subgenre of real-time strategy, gained popularity in the 2010s as a form of electronic sports, encompassing games such as the Defense of the Ancients (2003) mod for Warcraft III, its Valve-developed sequel Dota 2 (2013), League of Legends (2009) and Heroes of the Storm (2015). In a typical real-time strategy game, the screen is divided into a map area displaying the game world and terrain, units, and buildings, and an interface overlay containing command and production controls and often a "radar" or "minimap" overview of the entire map. The player is usually given an isometric perspective of the world, or a free-roaming camera from an aerial viewpoint for modern 3D games. Players mainly scroll the screen and issue commands with the mouse, and may also use keyboard shortcuts. In most real-time strategy games, especially the earliest ones, the gameplay is generally fast-paced and requires very quick reflexes. For this reason, the amount of violence in some games makes RTS games close to action games in terms of gameplay. Gameplay generally consists of the player being positioned somewhere in the map with a few units or a building that is capable of building other units/buildings. Often, but not always, the player must build specific structures to unlock more advanced units in the tech tree. Often, but not always, RTS games require the player to build an army (ranging from small squads of no more than 2 units, to literally hundreds of units) and using them to either defend themselves from a virtual form of Human wave attack or to eliminate enemies who possess bases with unit production capacities of their own. Occasionally, RTS games will have a preset number of units for the player to control and do not allow building of additional ones. Resource gathering is commonly the main focus of the RTS games, but other titles of the genre place higher gameplay significance to how units are used in combat (Z: Steel Soldiers for example, awards credits for territory captured rather than gathered resources), the extreme example of which are games of the real-time tactical genre. Some titles impose a ceiling on the number simultaneous troops, which becomes a key gameplay consideration, a significant example being StarCraft, while other titles have no such unit cap. Micromanagement deals with a player's constant need to manage and maintain individual units and resources on a fine scale. On the other hand, macromanagement refers to a player's management of economic expansion and large-scale strategic maneuvering, allowing the player time to think and consider possible solutions. Micromanagement involves the use of combat tactics involved in the present, whereas macromanagement considers the greater scale of the game in an attempt to predict the future. Because of their generally faster-paced nature (and in some cases a smaller learning curve), real-time strategy games have surpassed the popularity of turn-based strategy computer games. In the past, a common criticism was to regard real-time strategy games as "cheap imitations" of turn-based strategy games, arguing that real-time strategy games had a tendency to devolve into "click-fests" in which the player who was faster with the mouse generally won, because they could give orders to their units at a faster rate. The common retort is that success involves not just fast clicking, but also the ability to make sound decisions under time pressure. The "clickfest" argument is also often voiced alongside a "button babysitting" criticism, which pointed out that a great deal of game time is spent either waiting and watching for the next time a production button could be clicked, or rapidly alternating between different units and buildings, clicking their respective button. A third common criticism is that real-time gameplay often degenerates into "rushes" where the players try to gain the advantage and subsequently defeat the opponent as quickly in the game as possible, preferably before the opposition is capable of successfully reacting. For example, the original Command & Conquer gave birth to the now-common "tank rush" tactic, where the game outcome is often decided very early on by one player gaining an initial advantage in resources and producing large amounts of a relatively powerful but still quite cheap unit—which is thrown at the opposition before they have had time to establish defenses or production. Although this strategy has been criticized for encouraging overwhelming force over strategy and tactics, defenders of the strategy argue that they're simply taking advantage of the strategies utilized, and some argue that it is a realistic representation of warfare. 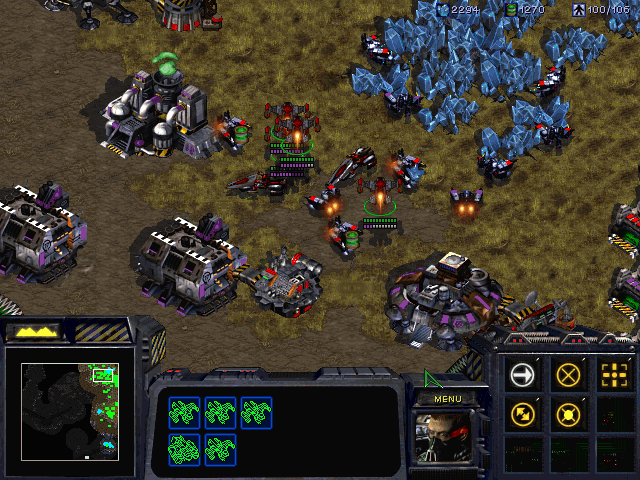 One of the most infamous versions of a rush is the "Zergling rush" from the real-time strategy game StarCraft, where the Zerg player would morph one of their starting workers (or the first one produced) into a spawning pool immediately and use all of their resources to produce Zerglings, attacking once they have enough to overwhelm any early defense; in fact, the term "zerging" has become synonymous with rushing. A fourth criticism of the RTS genre is the importance of skill over strategy in real-time strategy games. The manual dexterity and ability to multitask and divide one's attention is often considered the most important aspect to succeeding at the RTS genre. According to Troy Dunniway, former Westwood developer who has also worked on Command and Conquer 3: Tiberium Wars, "A player controls hundreds of units, dozens of buildings and many different events that are all happening simultaneously. There is only one player, and he can only pay attention to one thing at a time. Expert players can quickly flip between many different tasks, while casual gamers have more problems with this." In general terms, military strategy refers to the use of a broad arsenal of weapons including diplomatic, informational, military, and economic resources, whereas military tactics is more concerned with short-term goals such as winning an individual battle. In the context of strategy video games, however, the difference is often reduced to the more limited criteria of either a presence or absence of base building and unit production. In an article for Gamasutra, Nathan Toronto criticizes real-time strategy games for too often having only one valid means of victory — attrition — comparing them unfavorably to real-time tactics games. Players' awareness that the only way for them to win or lose is militarily makes them unlikely to respond to gestures of diplomacy. The result is that the winner of a real-time strategy game is too often the best tactician rather than the best strategist. Troy Goodfellow counters this by saying that the problem is not that real-time strategy games are lacking in strategy (he says attrition is a form of strategy), rather it is that they too often have the same strategy: produce faster than you consume. He also states that building and managing armies is the conventional definition of real-time strategy, and that it is unfair to make comparisons with other genres. In an article for GameSpy, Mark Walker criticizes real-time strategy games for their lack of combat tactics, suggesting real-time tactics games as a more suitable substitute. He also says that developers need to begin looking outside the genre for new ideas in order for strategy games to continue to be successful in the future. A debate has emerged between fans of real-time strategy (RTS) and turn-based strategy (TBS) (and related genres) based on the merits of the real-time and turn-based systems. Some titles attempt to merge the two systems: for example, the role-playing game Fallout uses turn-based combat and real-time gameplay, while the real-time strategy games Homeworld, Rise of Nations, and the games of the Total War series allow the player to pause the game and issue orders. Additionally, the Total War series has a combination of a turn-based strategy map with a real-time battle map. Another example of a game combining both turn-based game and real-time-strategy is The Lord of the Rings: The Battle for Middle-Earth II which allows players, in a 'War of the Ring' game, to play a turn-based strategy game, but also battle each other in real time. Despite Herzog Zwei, a console game, laying the foundations for the real-time strategy genre, RTS games never gained popularity on consoles like they did on the PC platform. Real-time strategy games made for video game consoles have been consistently criticized due to their control schemes, as the PC's keyboard and mouse are considered to be superior to a console's gamepad for the genre. Thus, RTS games for home consoles have been met with mixed success. Scott Sharkey of 1UP notes that Herzog Zwei had already "offered a nearly perfect solution to the problem by giving the player direct control of a single powerful unit and near autonomy for everything else," and is surprised "that more console RTS games aren't designed with this kind of interface in mind from the ground up, rather than imitating" PC control schemes "that just doesn't work very well with a controller". Some handheld consoles like Napoleon on the GBA uses a similar solution. However, Halo Wars, which was released in 2009 for the Xbox 360, generated generally positive reviews, achieved an 82% critic average on aggregate web sites, and sold over 1 million copies. According to IGN, the gameplay lacks the traditional RTS concepts of limited resources and resource gathering and lacks multiple buildings. Total Annihilation (1997) was the first real-time strategy game to utilize true 3D units, terrain, and physics in both rendering and in gameplay. For instance, the missiles in Total Annihilation travel in real time in simulated 3D space, and they can miss their target by passing over or under it. Similarly, missile-armed units in Earth 2150 are at a serious disadvantage when the opponent is on high ground because the missiles often hit the cliffside, even in the case when the attacker is a missile-armed helicopter. Homeworld, Warzone 2100 and Machines (all released in 1999) advanced the use of fully 3D environments in real-time strategy titles. In the case of Homeworld, the game is set in space, offering a uniquely exploitable 3D environment in which all units can move vertically in addition to the horizontal plane. However, the near-industry-wide switch to full 3D was very gradual and most real-time strategy titles, including the first sequels to Command & Conquer, initially used isometric 3D graphics made by pre-rendered 3D tiles. Only in later years did these games begin to use true 3D graphics and gameplay, making it possible to rotate the view of the battlefield in real-time. Spring is a good example of the transformation from semi-3D to full-3D game simulations. It is an open-source project which aims to give a Total Annihilation game-play experience in three dimensions. The most ambitious use of full 3D graphics was realized in Supreme Commander, where all projectiles, units and terrain were simulated in real time, taking full advantage of the UI's zoom feature, which allowed cartographic style navigation of the 3D environment. This led to a number of unique gameplay elements, which were mostly obscured by the lack of computing power available in 2007, at the release date. Japanese game developers Nippon Ichi and Vanillaware worked together on Grim Grimoire, a PlayStation 2 title released in 2007, which features hand-drawn animated 2D graphics. From 2010, real-time strategy games more commonly incorporated physics engines, such as Havok, in order to increase realism experienced in gameplay. A modern real-time strategy game that uses a physics engine is Ensemble Studios' Age of Empires III, released on October 18, 2005, which used the Havok Game Dynamics SDK to power its real-time physics. Company of Heroes is another real-time strategy game that uses realistically modeled physics as a part of gameplay, including fully destructible environments. RTS World tournaments have been held for both StarCraft and Warcraft III since their 1998 and 2002 releases. The games have been so successful that some players have earned over $200,000 at the Warcraft III World Championships. In addition, hundreds of StarCraft II tournaments are held yearly, as it is becoming an increasingly popular branch of e-sports. Notable tournaments include MLG, GSL, and Dreamhack. RTS tournaments are especially popular in South Korea. ^ Bruce Geryk. "A History of Real-Time Strategy Games". GameSpot. Archived from the original on April 27, 2011. Retrieved March 31, 2008. Early computer strategy games adhered firmly to the turn-based concepts of their board game ancestors, where—by necessity—players had time to plan their turns before their opponents had a chance to move. Real-time strategy changed all of that so that games would begin to more closely resemble reality: Time was limited, and if you wasted yours, your opponents would probably be taking advantage of theirs. ^ a b c d Geryk, Bruce. "A History of Real-Time Strategy Games". GameSpot. Retrieved May 29, 2007. ^ a b c d e Adams, Dan (April 7, 2006). "The State of the RTS". IGN. Retrieved May 31, 2007. ^ Bruce Geryk. "A History of Real-Time Strategy Games". GameSpot. Retrieved March 31, 2008. It wasn't until some time after the game was in development that I decided to call it "real-time strategy"--it seems obvious now, but there was a lot of back and forth between calling it a "real-time war game", "real-time war", "wargame", or "strategy game". I was deeply concerned that words like "strategy" and "wargame" would keep many players from even trying this completely new game dynamic. Before 1992, wargames and strategy games were very much niche markets—with the exception of Sid Meier's work—so my fears were justified. But in the end, it was best to call it an "RTS" because that is exactly what it was. ^ "Top ten real-time strategy games of all time". GameSpy. Archived from the original on June 16, 2010. Retrieved December 2, 2008. You can't really talk about the real-time strategy genre without giving a nod to Dune II, the title that kicked off the phenomena. ^ Bruce Geryk. "A History of Real-Time Strategy Games". GameSpot. Retrieved March 31, 2008. Although games such as Populous and SimCity are certainly played in real time, these give rise to the "god game" genre, which includes such titles as the city-builder series from Impressions, Will Wright's innovative designs, and much of Peter Molyneux's work, including the upcoming Black & White. Games in this genre tend to appeal to their own fans, and while there definitely is an overlap between these two genres, gamers generally see them as distinct from one another. ^ Barry, Tim (1981-05-11). "In Search of the Ultimate Computer Game". InfoWorld. pp. 11, 48. Retrieved 2019-04-17. ^ a b Moss, Richard (September 15, 2017). "Build, gather, brawl, repeat: The history of real-time strategy games". Ars Technica. Retrieved October 20, 2017. ^ "The evolution of gaming: computers, consoles, and arcade". Ars Technica. 2005-10-11. ^ Weiss, Brett (2011). Classic Home Video Games, 1972–1984: A Complete Reference Guide. McFarland & Co. p. 291. ISBN 9780786487554. ^ Loguidice, Bill; Barton, Matt (2009). Vintage Games: An Insider Look at the History of Grand Theft Auto, Super Mario, and the Most Influential Games of All Time. Boston: Focal Press. p. 238. ISBN 978-0240811468. ^ Loguidice, Bill; Barton, Matt (2012). Vintage Games: An Insider Look at the History of Grand Theft Auto, Super Mario, and the Most Influential Games of All Time. CRC Press. p. 73. ISBN 9781136137587. ^ Barton, Matt. "The History of Computer Role-Playing Games Part 2: The Golden Age (1985-1993)". Gamasutra. Retrieved October 16, 2017. SSI's most famous non-CRPG game is probably Cytron Masters (1982), one of the first (if not the first) real-time strategy games. ^ a b c d e Scott Sharkey. "Hail to the Duke". 1UP.com. Archived from the original on September 13, 2004. Retrieved March 1, 2011. ^ Sartori-Angus, Alan (December 1982). "Cosmic Conquest". BYTE. pp. 3, 124. Retrieved 19 October 2013. ^ "RTSC Historical RTS List". Retrieved August 5, 2006. ^ "IGN's Top 100 Games of All Time". Top100.ign.com. Retrieved 2011-06-01. ^ a b Glancey, Paul (April 1990). "Mean Machines: Herzog Zwei". Computer and Video Games (101): 103. Retrieved 4 February 2012. ^ a b c d "The Making of... Dune II". Edge. Next-Gen.biz. December 9, 2008. Retrieved July 27, 2011. "The inspiration for Dune II was partly from Populous, partly from my work on Eye Of The Beholder and the final and perhaps most crucial part came from an argument I once had with Chuck Kroegel, then vice president of Strategic Simulations Inc ... The crux of my argument with Chuck was that wargames sucked because of a lack of innovation and poor design. Chuck felt the category was in a long, slow decline, because the players were moving to more exciting genres ... I felt that the genre had a lot of potential – the surface was barely scratched as far as I as [sic] concerned, especially from a design standpoint. So I took it as a personal challenge and figured how to harness realtime dynamics with great game controls into a fast-paced wargame . . . Herzog Zwei was a lot of fun, but I have to say the other inspiration for Dune II was the Mac software interface. The whole design/interface dynamics of mouse clicking and selecting desktop items got me thinking, ‘Why not allow the same inside the game environment? Why not a context-sensitive playfield? To hell with all these hot keys, to hell with keyboard as the primary means of manipulating the game! ^ Clarke-Willson, Stephen (August 18, 1998). "The Origin of Realtime Strategy Games on the PC". The Rise and Fall of Virgin Interactive. Above the Garage Productions. Archived from the original on 2003-05-04. Retrieved 30 January 2012. ^ "The Essential 50 Part 31: Herzog Zwei". Archived from the original on September 13, 2004. Retrieved December 17, 2006. ^ a b Walker, Mark. "Strategy Gaming: Part I – A Primer". GameSpy. Archived from the original on August 10, 2010. Retrieved October 28, 2007. ^ "The History of Command & Conquer". NowGamer. Retrieved May 14, 2014. ^ TDA (June 6, 2008). "The History of Real Time Strategy, Part 3.2: Polygons and Pixels, continued". gamereplays.org. Retrieved March 23, 2011. Homeworld was the first fully three-dimensional RTS game to be released. ^ "Sacrifice". StrategyPlanet. December 6, 2000. Archived from the original on December 26, 2007. Retrieved November 19, 2007. ^ Hargosh, Todd. "Emperor's Spice Flows Strong". Game Industry News. Archived from the original on February 26, 2008. Retrieved November 19, 2007. ^ "Age of Empires 3 PC Review". TTGamer. Retrieved November 19, 2007. ^ Fahrenbach, Achim (April 25, 2010). "Dancing on the timeline". Spiegel Online (in German). Retrieved August 30, 2011. ^ a b c Walker, Mark. "Strategy Gaming: Part V – Real-Time vs. Turn-Based". GameSpy. Archived from the original on December 21, 2008. Retrieved October 28, 2007. ^ "Theatre of War by 1C and Battlefront – Interview". Armchair General Magazine. Retrieved June 2, 2007. ^ a b "Point – CounterPoint: Turn Based vs. Real Time Strategy". Strategy Planet. June 27, 2001. Archived from the original on February 26, 2007. Retrieved April 5, 2007. ^ Walker, Mark. "Strategy Gaming: Part II". GameSpy. Archived from the original on January 5, 2010. Retrieved October 28, 2007. ^ This mostly a concern with older RTS games that did not feature building queues, meaning that players would have to click the button to build a unit soon after it was completed. However, in some games where units have timed abilities that must be explicitly activated, for instance heroes in the real-time tactics game Mark of Chaos this is still a concern. ^ "StarCraft vs Dawn of War". IGN. August 6, 2004. Archived from the original on April 14, 2009. Retrieved December 1, 2007. ^ "RTS Design". Aspects of real-time strategy. September 2007. Archived from the original on September 27, 2007. Retrieved September 13, 2007. ^ a b Keefer, John (July 8, 2005). "Supreme Commander Interview (PC)". GameSpy. Retrieved November 4, 2007. ^ Toronto, Nathan (January 24, 2008). "The Future Of The Real-Time Strategy Game". Gamasutra. Retrieved February 2, 2010. ^ Goodfellow, Troy (January 28, 2008). "The Future Of The RTS – A Counter-Opinion". Gamasutra. Retrieved February 2, 2010. ^ Walker, Mark (February 2002). "Strategy Gaming: Part VI – Where the Genre is Headed". GameSpy. Archived from the original on October 30, 2007. Retrieved February 13, 2010. ^ Ocampo, Jason (July 7, 2006). "The Lord of the Rings, The Battle for Middle-earth II (Xbox 360)". CNET. Retrieved November 4, 2007. ^ "Halo Wars (xbox360: 2009) Reviews". Metacritic. Retrieved March 6, 2009. ^ "Halo Wars for Xbox 360". GameRankings. Retrieved March 6, 2009. ^ Geddes, Ryan (February 20, 2009). "Halo Wars Review; Ensemble takes Halo, and real-time strategy, to a whole new planet". IGN. Retrieved March 6, 2009. ^ "Havok Enables Age of Empires III". Havok announces the use of the Havok Game Dynamics SDK in Age of Empires III. October 18, 2005. Archived from the original on April 30, 2009. ^ Burnes, Andrew (September 11, 2006). "Company of Heroes Review". IGN. Retrieved January 24, 2011. Chambers, C.; Feng, W.; Feng, W.; Saha, D. (2005). Mitigating information exposure to cheaters in real-time strategy games. Proceedings of the International Workshop on Network and Operating Systems Support for Digital Audio and Video. New York: ACM. pp. 7–12. doi:10.1145/1065983.1065986. ISBN 978-1-58113-987-7. Claypool, Mark (September 15, 2005). "The effect of latency on user performance in Real-Time Strategy games". Computer Networks. 49 (1): 52–70. doi:10.1016/j.comnet.2005.04.008. Cheng, D.; Thawonmas, R. (November 2004). "Case-based plan recognition for real-time strategy games" (PDF). Proc. Of the 5th Game-On International Conference: 36–40. Aha, D.; Molineaux, M.; Ponsen, M. (September 7, 2005). Muñoz-Ávila, HéCtor; Ricci, Francesco, eds. Learning to Win: Case-Based Plan Selection in a Real-Time Strategy Game. Case-Based Reasoning Research and Development. Lecture Notes in Computer Science. 3620. Springer Berlin / Heidelberg. pp. 5–20. doi:10.1007/11536406. ISBN 978-3-540-28174-0. Chan, H.; Fern, A.; Ray, S.; Wilson, N. & Ventura, C. (2007). "Online planning for resource production in real-time strategy games" (PDF). Proceedings of the International Conference on Automated Planning and Scheduling. This page was last edited on 18 April 2019, at 19:29 (UTC).